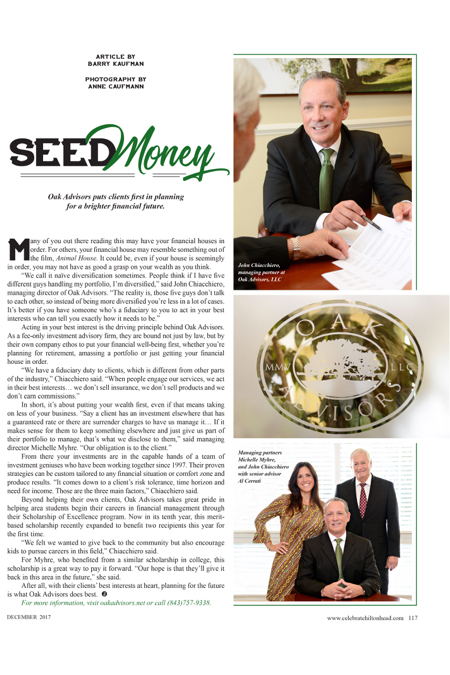 Hilton Head Magazines: CH2/CB2: Seed Money: Oak Advisors puts clients first in planning for a brighter financial future. Many of you out there reading this may have your financial houses in order. For others, your financial house may resemble something out of the film, Animal House. It could be, even if your house is seemingly in order, you may not have as good a grasp on your wealth as you think. Acting in your best interest is the driving principle behind Oak Advisors. As a fee-only investment advisory firm, they are bound not just by law, but by their own company ethos to put your financial well-being first, whether you’re planning for retirement, amassing a portfolio or just getting your financial house in order. From there your investments are in the capable hands of a team of investment geniuses who have been working together since 1997. Their proven strategies can be custom tailored to any financial situation or comfort zone and produce results. “It comes down to a client’s risk tolerance, time horizon and need for income. Those are the three main factors,” Chiacchiero said. Beyond helping their own clients, Oak Advisors takes great pride in helping area students begin their careers in financial management through their Scholarship of Excellence program. Now in its tenth year, this merit-based scholarship recently expanded to benefit two recipients this year for the first time. “We felt we wanted to give back to the community but also encourage kids to pursue careers in this field,” Chiacchiero said. For Myhre, who benefited from a similar scholarship in college, this scholarship is a great way to pay it forward. “Our hope is that they’ll give it back in this area in the future,” she said. After all, with their clients’ best interests at heart, planning for the future is what Oak Advisors does best. For more information, visit oakadvisors.net or call (843)757-9338.